Producer Samuel Bronston is known for producing a series of epic high spectacle films with impressive casts and huge sets. Bronston went to Spain in 1958 to make an adventure film. John Paul Johns directed by John Farrow. He found extremely good conditions to finance films in Europe thanks to American entrepreneur Pierre S. Dupont III. Spanish government gave him a preferential treatment in order to film on historical locations. He also found Spanish’s low rates very affordable for filming. British and American started to used Spanish locations since the middle 50 ´s, and when Bronston arrived, he found a highly qualified crew in all departments. Samuel’s Bronston created his Studios near Madrid, where they built enormous sets for his epic films played by some of the most famous Hollywood stars. To recreate those fabulous sets he contracted some of the most prestigious art directors and production designers of that moment. Other Hollywood epic films like Ben-Hur, Cleopatra or The ten Commandments, are full of miniatures and matte paintings. At Bronston films, everything had to be built real size. They have the money and the technicians to make it that way. There were only a few exceptions to that rule. His first Epic film was, King of Kings (1960) directed by Nicholas Ray and distributed by MGM. Art direction under George Whakevich and Enrique Alarcón. Although both of them were frequent and accomplished users of “in camera” tricks involving foreground miniatures and glass paintings, at Bronston Films they favored the post-production matte painting technique. The few matte paintings on that film were done by MGM matte department under Lee Leblanc, with Matthew Yuricich as a matte painter. 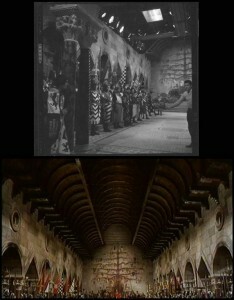 The sets were not as huge as the showed on the next films, but they built some impressive temple and square set. Construction crew built some reduced scale cityscape to be showed behind the walls of the temple square. They also used some huge background paintings of the city. Construction department was under Francisco Prosper, who was also a miniature expert. Among his collaborators was scenic and glass painter Emilio Ruiz who was responsible for the scenic backings. Bronston next film was a medieval epic about the Spanish knight El Cid (1961) directed by Anthony Mann, with John Moore and Veniero Colasanti as production designers. 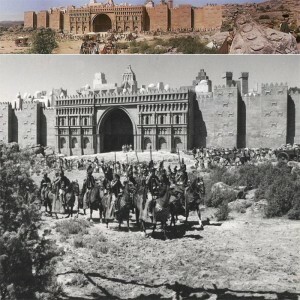 Historical locations and huge sets were built. All the exteriors were full size this time, with no miniatures or matte paintings. 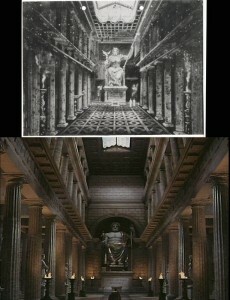 Only to enhance the impressive interior sets they used a matte painting for the ceiling of the Throne room. 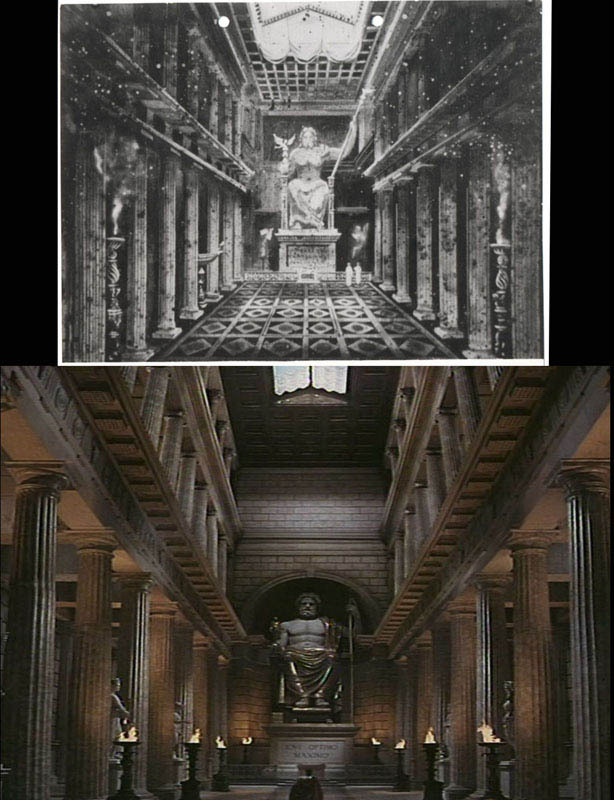 There was not a big production company distributing the film with a FX department, so the matte painting was probably executed at London by any British matte artist, but it remains a mystery who painted that ceiling. The four Bronston film was Nicholas Ray’s 55 days in Peking (1963) again with Colasanti and Moore as production designers. After the success of El Cid Bronston was at the height of his career. They built a gigantic set to represent the city of Peking. No miniatures or matte paintings were required this time. All buildings were full size, a real delight for Alex Weldon, head of the FX crew that had to destroy it. Miniature of the Pekin set that was built full size near Madrid. 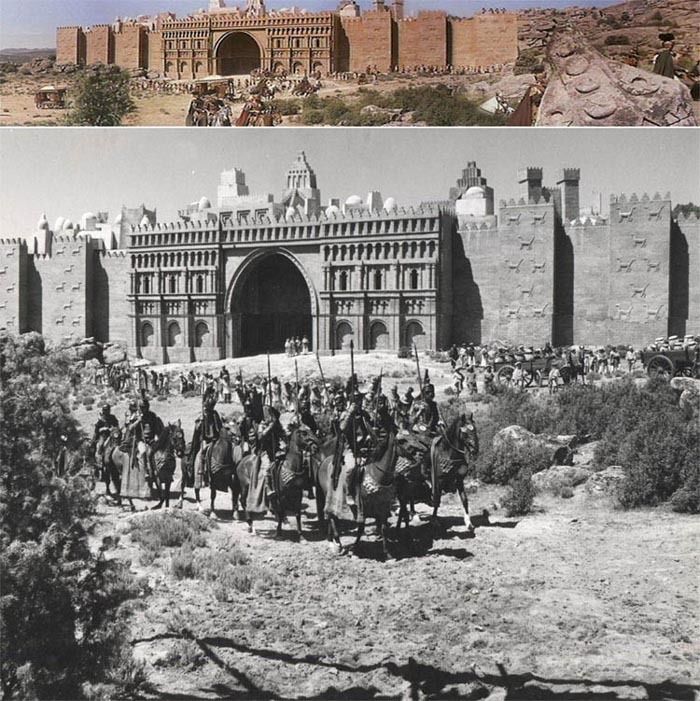 Although 55 days in Peking was not a box office success like El Cid, Bronston, embarked again on an enormous epic film where they recreated the ancient Rome for The fall of the Roman Empire (1964). 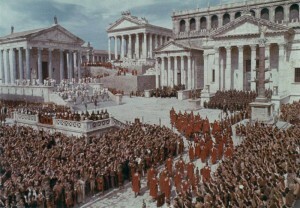 The Roman forum set was the biggest ever built with no miniatures or paintings. 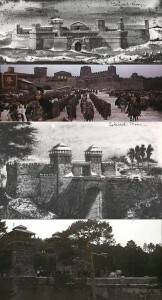 A huge roman fortress was also built at exteriors near Madrid. Two illustrations by art director Pierre Thevenet with the final image on the film. All the interiors were full size, but there was a matte painting again to provide a ceiling of the impressive set of the Temple. Production illustration by art director Pierre Thevenet and final matte painting by the unknown artist. 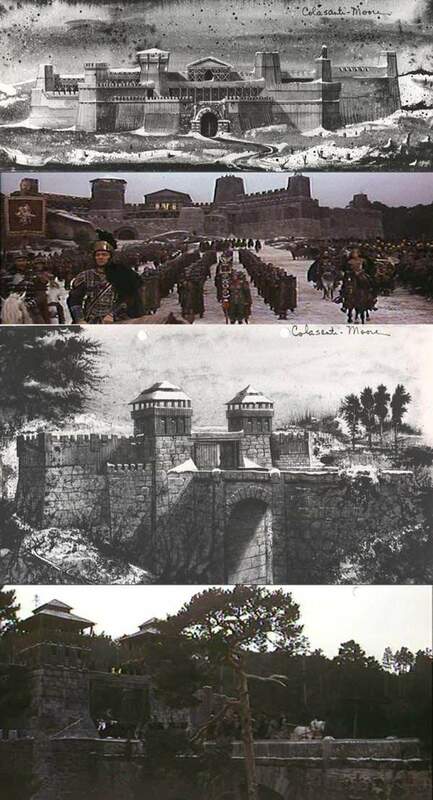 To show an exterior view of an Armenian city they built part of the walls on location near Madrid, and the rest was a huge foreground miniature that fit perfectly with the far away set. That miniature was made only for one shot filmed with a horizontal panoramic movement. The miniature was built by Francisco Prosper team. At the black and white photo, you can see the shadow of the structure that supported the miniature hidden behind the bush. It is also noticeable on the right side of the walls how the shadow of the miniature doesn’t fit exactly with the shadow of the real walls. There is another big set that is shown as medium shots and only once as an establishing shot showing the upper part. I suspect they used a foreground miniature or painting. The last big show for Bronston was The Circus world ( 1964) directed by Henry Hathaway. After the lack of success of the last two films, the budget of that one was abruptly reduced. They used reallocation for most of the Circus scenes renting Circo Price. Even so, they built some big sets that required impressive painting backings. They also used a miniature for the Circus fire sequence. Wally Veevers supervised the filming of the miniature with the assistance of Emilio Ruiz. For that film, it was used an in camera glass painting to show the Circus at Vienna city. Probably painted by Emilio Ruiz and Francisco Prosper. There was another matte painting commissioned for that film made at Shepperton matte department, London. But it was not used on the final edition. That was painted probably by matte artist Doug Ferris or Peter Melrose. The image without the painting as it appears on the film. Posted on 30 October, 2013 by Domingo Lizcano. Permanent link.